Today, this is the foundation that continues to fuel our passion and pursuit of excellence to help our clients be successful. Many hundreds of clients later, TTK continues to help people become more aware, learn to trust and honor one another, rebuild their team spirit and become accountable for their success or lack thereof. Call or email us today for a free consultation on how we can help you, too. For questions or to schedule a time to meet with me, please use my contact form. Whether your organization is a large business, small venture or charitable, Robin has the expertise to design a program that will improve your prospects and keep your valued team focused and productive. She has spoken to hundreds and worked one-on-one to educate, motivate, and cultivate an environment where positive results happen! Thompson Training & Keynote, Inc. (TTK) gets results by empowering people within corporations and nonprofit organizations. TTK unleashes the creativity of executive teams to find optimal solutions with clarity and purpose.  President Robin Thompson’s decades of experience working with Fortune 500 companies as a speaker and trainer, and her tenure as Vice President of a public university and nonprofit organization, have refined her ability to achieve successes through collaboration and commitment. She brings out the best in her clients! Robin has supervised staff, managed volunteers, and coached board members in her role as an Executive Director of foundations. She has led a marketing department, facilitated strategic planning, and been an entrepreneur for over 25 years. The graduate students in her executive MBA program rate her skill teaching leadership courses as one of the best. Participants in her presentations and workshops consistently give excellent evaluations. She is a natural at engaging others! Robin finds a way to take our jobs seriously, but ourselves lightly. She earned a Master’s Degree in Recreation Therapy from the University of Utah along with an undergraduate degree in Human Resources and Education. She builds trust and team spirit by helping everyone to be aware of and accountable for their role in the organization’s success. Principles from her book, Know Stress to NO Stress – A Guide to Achieving Life Balance, motivate her and others to meet and exceed their goals. With a desire for community service in mind, she completed her Fundraising Management Certification from Indiana University School of Philanthropy. Robin Thompson speaks on leadership and team building for corporations and fundraising for nonprofit organizations.